Can you 'EMF off!' for one day—25 March? - EMF Off! Can you ‘EMF off!’ for one day—25 March? By the end of 2017, an estimated 300 million people worldwide were feeling the effects of the man-made electromagnetic radiation from WiFi, cell towers, cell phones, smart meters and other wireless devices. Many of those individuals feel powerless against the massive telecoms industry and its progressive assault on our health, our human rights and our planet. Now we face the roll-out of 5G—the next generation of wireless technology, which will be 100 times more powerful than 4G and will have a severe impact on our environment as well as our bodies. But if 300 million people said NO to this intense radiation, while collectively focusing on the healthy environment they wished to create, inside and out, can you imagine the impact we would have? Together, we are more powerful than any industry on Earth. It is merely our lack of awareness of our power that keeps us stuck in subservience. Recognizing, embracing and activating our creatorship is the most powerful and effective thing we can do to create the world we want. The devastating impact of EMFs is pushing us to the limits of our tolerance, and it is time to push back with everything we’ve got. If we do this together, we will be unstoppable. We will be amazed and gratified by our global impact. We will fall in love with ourselves and our planet, and we will be committed to ensuring that both are protected, honoured and respected, for the benefit of all. ​Together, we are more powerful than any industry on Earth. It is merely our lack of awareness of our power that keeps us stuck in subservience. In my book, EMF off! 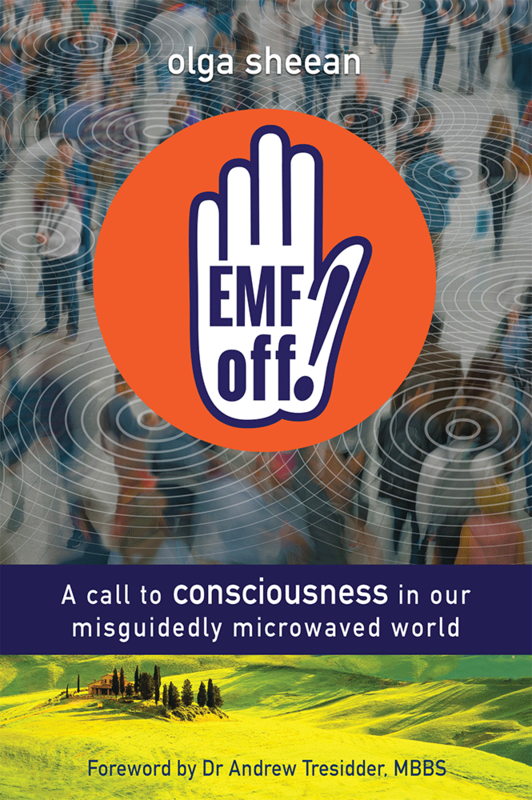 A call to consciousness in our misguidedly microwave world, I proposed having an international EMF off! day, which I invite you to celebrate with me on 25 March, which is also the International Day of Remembrance of the Victims of Slavery, endorsed by the United Nations. [i] We have been enslaved for far too long—enslaved to technology, to governments, and to our own dysfunction—and it’s time to break free. On this commemorative day, we can remind ourselves of who we really are. We can switch off our electronic devices (wired or otherwise) and instead connect in person with each other, our neighbours, our friends, our family and nature. Fittingly, this day comes after the International Day for the Right to the Truth Concerning Gross Human Rights Violations and for the Dignity of Victims (on 24 March). Reclaiming our autonomy and reclaiming our rights are one and the same, and we have the power and the responsibility to do both. ​Reclaiming our autonomy and reclaiming our rights are one and the same, and we have the power and the responsibility to do both. If we stay stuck in subservience, reacting to external circumstances rather than creating the circumstances we want, we do each other a great disservice. We compound our dysfunction and reinforce our position as victims, adding to the problem rather than being part of the solution. Let’s not do that any more. Let’s unite in empowerment rather than in victimhood, and in promoting the good news rather than the bad. Let’s share our stories of empowerment and success, rather than dwelling on or reinforcing our failure to have a meaningful impact. Let’s remind each other of our power as creators, rather than affirming what hasn’t worked. Let’s get ourselves switched on, fully activated in our humanity and fully empowered in the way we live. We owe it to each other to embody the change we want to see, when greatness beckons and our planet is at risk. Switch off from technology and switch on your humanity. Connect with family, friends and neighbours and be truly present, giving them your fullest attention, with no cell phones, computers or other distractions diluting your focus in the moment. Bring someone a gift, talk to people on the street and have a conscious conversation, really listening to what’s being said. Reduce the demand that you have helped to create. There is no industry on Earth that can survive unless we feed the demand for it. Likewise, if there is a demand for a healthier alternative, someone will invent a safer technology. Find a way to reduce your dependence on the wireless industry …and keep looking for eco-friendly alternatives. Switch from a smartphone to a flip phone, to be used only for essential calls. Do all other work and data downloads on a wired computer. It may be inconvenient, but so is cancer, which doesn’t come with an OFF switch. Reduce your ambient EMFs and boost your own electromagnetic field. Laughter, music, creativity, meditation, yoga and being in nature boost your electromagnetic field and nourish your spirit. The body thrives when nourished in these simple ways, all of which counter the negative effects of sitting at a computer, commuting to work or living in a high-rise building. Play with your dog, earth your body by lying on the grass, notice the trees and the changing season, look up at the sky, move your body and give your mind a rest. Wire and inspire. There are many benefits to having your computer hard-wired, beyond the health-related ones. Keeping your computer/laptop in your office or other designated workspace creates a healthy boundary between your virtual world and your real one. This enhances your relationships, your capacity to be emotionally present, and the importance you give to those close to you. By ‘closing the door’ on that other world of endless distractions, you immediately become more emotionally and physically available—to yourself as well as to others. In sharing more of yourself, you will inspire others to do the same. Pay attention to what you have neglected. What aspects of your self have you neglected or allowed to become dormant, while focusing on work, e-mails, texts or social media? If there’s some challenge in your life, go for a walk and let your mind ponder some creative solutions, instead of looking for instant answers online. In being electronically on, what have you not done for yourself? Buy yourself a plant. Go for a massage. Move your body. Cook an elaborate, delicious meal, using healthy organic ingredients and your own imagination. Read a book. Slow down and stop multi-tasking. We are all moving so fast that we rarely give ourselves a chance to process things or integrate life. Allow your mind to catch up and life will flow more smoothly. Do nothing. Sit in stillness, allow your body and mind to be peaceful, and give yourself a chance to get good at it. You will then be less likely to crave distractions or to depend on social media or other online interactions in the hope of creating a meaningful connection. Olga Sheean is an author, educator and empowerment trainer specializing in human dynamics and quantum potential. She is dedicated to activating the power of you and transforming the negative subconscious programs that drive your circumstances, relationships, health, performance, self-worth and success. Electro-sensitivity: devastating detour or doorway to a new life? It’s time to EMF off! Tweet with the EMF off! hashtag! ​Three ways to buy EMF off!